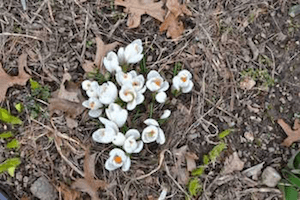 The crocuses, daffodils, and violets have sprung! Monastics and guests are out and about, removing dead grass from the garden that’s starting to bloom. It’s been a rainy spring with the occasional snow and hail shower, but forest work has begun and we enjoy clearing brush in the cool spring afternoons. Come offer service with us as we begin a new season of Offering Service Saturdays and open our doors for the year to guests and retreatants! See photos of our recent Spring activities here. After a week of rain and clouds, the day dawned bright and sunny. We had rehearsed the ordination ceremony the previous day, and done the hair shaving earlier that morning, and now it was happening! Alicia Blanco received the sramanera and siksamana ordinations. 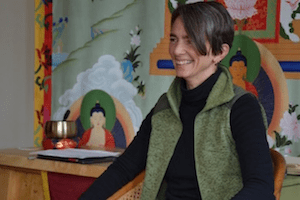 Alicia—whose new name is Thubten Nyima, the Sun of the Buddha’s Teaching—has been a Dharma student for many years and has attended many Exploring Monastic Life courses at the Abbey. She has spent nearly a year living at the Abbey as an anagarika—someone with eight precepts who wears a blue outfit. Ven. Chodron was the preceptor (upadhyaya); Ven. Jendy who kindly came from Seattle to join us, was the instructor (acarya); Ven. Tarpa was the chant master, Ven. Semkye the karman master, and Ven. Samten the guide. The entire sangha was present, and many lay followers attended the parts of the ceremony that were open to guests. The ceremony went very well, and when it was concluded Rebecca, who is visiting us from New Zealand, received the anagarika precepts from Ven. Chodron (and inherited Ven. Nyima’s blue outfit since they are about the same size). Everyone in the Abbey community is delighted to welcome our fourteenth monastic! Rejoice in the ordination photos here and here. Bios and photos of all our new community members, including Ven. Nyima, are now on the Our Community web page. The April Sharing the Dharma Day was special in many regards. We began teachings on An Open-Hearted Life , by Dr. Russell Kolts and Ven. Thubten Chodron, which will be the basis of all the Sharing the Dharma Days this year. Ven. Chodron read and spoke about the preface by H.H. the Dalai Lama, which began with his well-known statement, “My religion is kindness.” Watch or listen to the teaching here. After meditation and teachings in the morning, we celebrated the completion of the winter retreat by doing the Lama Chopa puja. This was followed by the Abbey community giving gifts to our friends who supported the retreat and enabled us to have these months of concentrated meditation and study. This was a beautiful and warm exchange with much joy. See photos here. 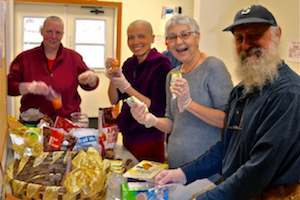 A record number of people attended this Sharing the Dharma Day—around 82 to 85 we figured. A diverse group of new people came, as did many of the “regulars,” which made for rich discussions. We are coming to realize that we must soon start planning for a new temple to accommodate more people who want to learn the Buddha’s teachings. 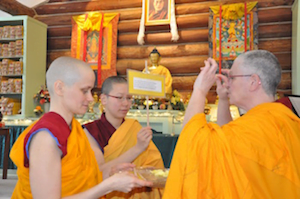 The sangha completed its three-month winter varsa or “snows retreat,” which is one of the three main Vinaya practices of a full-fledged sangha. On the day before its ending we confess our transgressions and perform the “stick ceremony” to count the number of monastics in the retreat. After weeks of spring weather, it snowed again during the entire ceremony. The monastics saw it as a huge purification, with many tiny Vajrasattvas falling from the sky. The following day was the pravarana or invitation, where each monastic invites the feedback of the community regarding any unconfessed transgressions that they may have seen, heard, or suspected. See pravarana photos here. After this, the sangha is supposed to leave the monastery for an outing to celebrate three months of virtuous practice. Ven. Chodron spoke on “The Power of Respect” at North Idaho College. Both students and the public attended—about three hundred people. There was a lively Q&A session, and many people said the talk gave them a lot to think about, especially how to improve the level of civil discourse in the country now. Watch the talk here. The next day, Vens. Semkye and Jampa visited Dr. Laura Templeman’s World Religions Class to answer questions on Buddhism and monastic life. Abbey nuns returned to lead the weekly Monday meditation class at the Spokane Unitarian Universalist Church with much joy. Vens. Chonyi and Jigme are wrapping up our study of the final chapters of An Open-Hearted Life . UUs over the state line also appreciate Buddha’s teachings. Ven. Chonyi spoke at a North Idaho Unitarian Universalist fellowship service on “What Do You Stand For?” It’s a topic close to the heart of the UU principles, and Ven. Chonyi always finds the congregation receptive and welcoming. Ven. Tarpa shared about the Abbey at a Newport PEO meeting. PEO is a philanthropic and educational organization that supports education and achievement for women. The Newport chapter is over 100 years old! The receptive audience ranged in age from a few months to 90-plus, and they enjoyed learning about the Abbey’s mission and way of life. Ven. 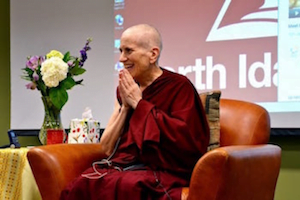 Chodron left for her spring teaching tour in early April. She went first to Smith College, a women’s college in Massachusetts, at the invitation of Dr. Jay Garfield, a professor there. At Smith, and at other of the Five Colleges in the area, she spoke at faculty seminars and undergraduate classes, and gave a public talk. 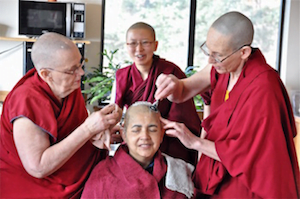 Watch the talk on “Life as a Western Buddhist Nun.” Ven. Chodron especially likes working with young adults and watching their eyes light up when they come across new ideas that expand their horizons. From there, Ven. 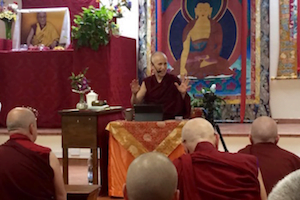 Chodron went to the Boston area, to teach on “Good Karma” at Kurukulla Center. She also saw many old friends there and visited with the publishers of her books, Wisdom Publications and Shambhala Publications. Watch the teachings here. 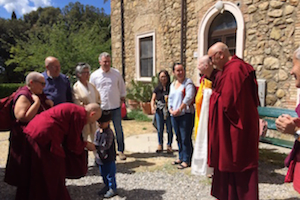 Then it was across the Atlantic Ocean to Pomaia, Italy, and the Istituto Lama Tsong Khapa, where Ven. Chodron was the spiritual program coordinator and the sangha gegu (disciplinarian) back in 1979-80. At that time, the institute had just begun and things were chaotic. Now the institute is a thriving center for the Master’s Program, Discovering Buddhism, the Basic Program, the Mindfulness Project, and many other projects that spread compassion in the world. This is a good example of impermanence working its wonders in terms of improving living beings’ lives! 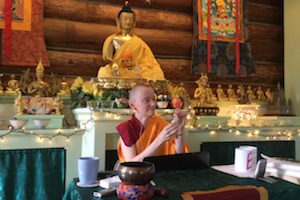 For four days, she addressed the sangha there—they had requested that she speak about the importance of monastics in the modern world and their role in helping society and spreading the Dharma, how to establish a monastery and create community out of a group of individuals. Many discussions revolved around one monastic’s question on the first day: how do we remain loyal to our spiritual tradition and the monastic life and at the same time adapt it to fit circumstances in our culture and times. Listen to the audio of her talk on The Power of a Kind Motivation. This was followed by a four-day retreat attended by over one hundred people on “Disarming the Mind: Working with Anger for a Happier Life.” Here Ven. Chodron taught the Buddhist approach to this topic in the morning and in the afternoon, she brought in ideas from Marshall Rosenberg’s nonviolent communication. People really liked this combination of perspectives, both of which center around opening our hearts to the well-being of others and changing our perspective on situations. See photos here. After eleven days in Italy, Ven. Chodron and Caz Lockwood, a student traveling with her as an assistant, headed for Frankfurt, Germany, where Ven. Chodron will lead a weekend course on “Good Karma: Creating the Causes for Happiness and Avoiding the Causes for Suffering.” We’ll tell you more about this and the rest of her tour in the next enews. When Ven. Chodron founded Sravasti Abbey in 2003, there was one main, habitable building and three residents—one nun and two cats. Soon, however, guests and residents began to arrive, our lone building was bustling, and Ven. Chodron needed a quiet place to write. In 2004, her students built a small writing studio near the main house. It had no plumbing. There was a composting toilet and a large jug for hauling water from the main house. She has been meditating, writing, and basically living there ever since. She still hauls drinking water from Ananda Hall and hikes to another building in rain, snow, and fair weather for her showers. The Abbey community has encouraged Ven. Chodron for several years to let us build a proper Abbess’ residence. Ven. Samten has taken the lead in persuasive techniques, including organizing the design and agreeing to oversee construction. You might enjoy the hilarious video Ven. 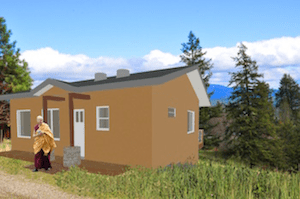 Samten made —Journey to Prajna House— that shows the community pleading with Venerable to agree to build a residence. At last, we have the OK to move forward this summer. The building even has a name—Prajna House. “Prajna” is Sanskrit for wisdom, suggesting that wisdom is necessary in leading a monastic community. Prajna House is not for Ven. Chodron alone. It’s the future residence of subsequent abbots or abbesses as well. And like all Abbey buildings, it will be built to last, with respect for the environment, and through the kindness of others. Project details will be on the Abbey website soon. We expect construction to begin as soon as the ground dries out — hopefully by June. Watch for the news. To support and enhance our skills in community living, the Abbey has studied and practiced Nonviolent Communication (NVC) for some years now. Originally developed by Marshall Rosenberg, NVC is a communication model that teaches how to connect deeply, honestly, and compassionately with others. In recent years, we’ve had the privilege of working via the Internet with NVC trainer LaShelle Lowe-Chardé from Portland, Oregon. At last, LaShelle could visit us in person to offer an intensive 3-day workshop. We focused on strengthening basic skills and learned techniques for conflict resolution and offering and accepting feedback. The workshop incorporated active listening, group discussion, and modeling. It was fun, challenging, and illuminating for everyone and deepened our commitment to clear communication. How do we keep our hearts open in challenging times? Thirty-five people spent a thought-provoking weekend reflecting on how to develop compassion in response to our own and others’ suffering. Vens. Chonyi and Samten led the retreat, weaving teachings from the stages of the path to awakening with examples from personal experience, even including a TED talk by Pope Francis! Other members of the community guided meditations and led discussions, including a contemplation on imagining challenging people as babies or very, very old. We even posted baby photos of famous politicians! You can watch the talks here. Photos are here. Want to bring your Dharma practice into your spring cleaning? Bev shares her experience with this. Ven. 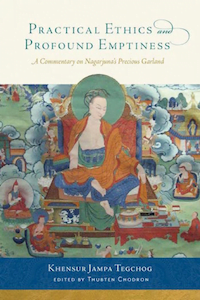 Nyima wrote an excellent article on advocacy and governance from a Buddhist perspective based on the teachings in Nagarjuna’s Precious Garland. Khensur Jampa Tegchok’s commentary on this wonderful text, edited by Ven. Chodron, is now out— Practical Ethics and Profound Emptiness . Mandala Publications has just released a new ebook, From Warm Heart to Warm Heart: The Transmission of Dharma in the Modern World . It contains 17 interviews with scholars and teachers of Buddhism, including one by Ven. Chodron. You can purchase it here. Those of you who haven’t seen John Oliver’s interview with H.H. the Dalai Lamacan find it online. The actual interview begins around the ten-minute mark. Ron, a prisoner whom Ven. Chodron has known for many years, describes how he cultivates empathy in the difficult environment of prison.